Eva Valley Meats is located at the Old Cameron Downs farm in Eva Valley, 107km from Darwin City Centre near the town of Batchelor. The farm and on-site abattoir are owned by Pete Cogill & Fiona McBean, both of whom were born in the Northern Territory. Aided by a tight knit team, they are very passionate about supplying fresh local product to Darwin & the surrounding area. 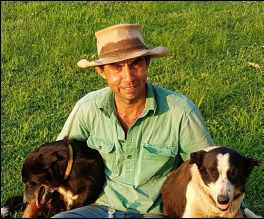 Pete was born in Darwin and has lived and worked on several different stations in the top end of the Northern Territory. Although a Diesel Fitter by trade he chose to come back to the cattle industry soon after finishing his apprenticeship to work alongside his father at Litchfield Station. Pete has acquired his butchering skills whilst working on larger stations that butcher and supply all of their own meat to stockcamps and staff. He has an eye for detail and is committed to breeding a herd to produce consistent quality carcasses. Fiona was born in Katherine and also grew up in the remote Northern Territory. She has worked on cattle stations in the Northern Territory, Queensland and Canada and holds a Batchelor of Agribusiness, a Certificate in Holisitic Management and a Certificate III in Meat Processing (Meat Hygiene). Fiona is a strong advocate of healthy living, enjoys cooking with home grown vegetables and herbs, and has created each of the sausage and rissole recipes in her own kitchen.